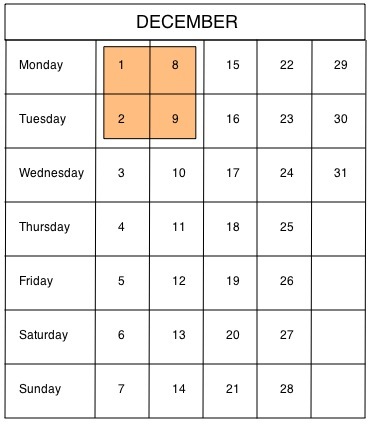 Below is a copy of a calendar for 2008 showing December. Put a square box around the 1st , 2nd , 8th and 9th . Choose two of the numbers and add them together. Choose another pair and add them. Keep going until you have made all the pairs. What do you notice about the answers? Put a box around another set of four numbers and try this again. Try multiplying - perhaps you could use a calculator to help. What happens in other months? Place value. Combinations. Trial and improvement. Addition & subtraction. Working systematically. Describing Sequences. Investigations. Generalising. Practical Activity. Multiplication & division.